To be fair, a dead rubber against a team making a 500 mile round trip is not going to attract the same attendance as teams with something more meaningful to play for. Looking at the crowd, it didn't even look anything like the official attendance. Keep your eyes peeled for season tickets chucked in bushes from various points of this season. You can use the half time raffle prize index to calculate the crowd. Yesterday's prize was £202 which indicates an attendance of 1148. I've just made that up btw. I've just made that up btw. We will probably be out numbered. I just cannot see us having many, I have been looking at attendances for the last 3 seasons and we must be in the region of 400 light this season and fear for the take up of season tickets (even at the fantastic price) until fans see an incoming of better players. they have put that right but it will take take time to revisit the damage .. I was an absentee season ticket holder for yesterday's game as I'm away in freezing cold Whitby on holiday. Would i have been included the attendance even though I was not there? As a matter of interest i offered my ticket to several casual supporters and nobody wanted it, even mates who have had it before. To be fair I recently turned down my mate's VIP Old Trafford season ticket as I couldn't be bothered driving there and back on a week night. so which game are you talking about JMC? 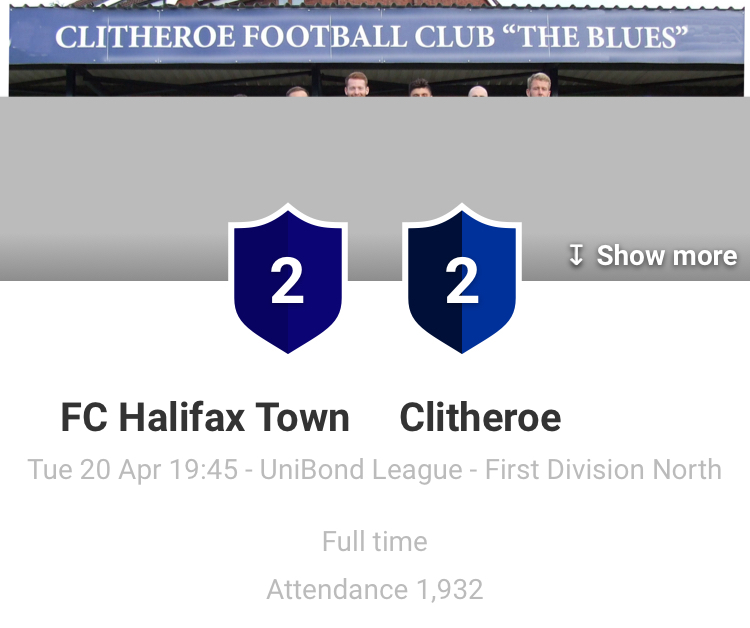 Sure it was clitheroe thurs night Simon Garner playing for them , title in the bag 2.900 there !!! I see fax only got 728 for their game Thurs night against London Broncos. You are wrong Nick they are supporters and many have been for a long long time but unfortunately I believe that is what will happen. Every fan has their opinion on football some players they like more than others that does not make anyone right or wrong or if they have a different thought to you it does not make them any less of a supporter. my statement was over the conditionality of some .. I will only buy a season ticket if I like who we sign..
with the deal they are offering now everybody should be trying to buy a ticket..
Just read a certain Mr croad is back at the shay as footballing manager and straight out with the begging bowl to sign a former player.